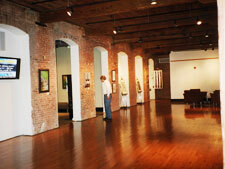 MONTCO's new “digs”: a beautiful space to show off works of art. “Come on In!” Monty welcomes guests to the exhibit. Paul checks out the art work at Montgomery County Community College 's new art gallery. 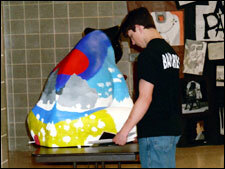 Announcing MONTCO's 2006 Students' Art Exhibition and Competition. Monty welcomes guests to Montgomery County Community Colleges 2006 Student Art Exhibition and Competition. 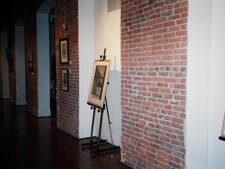 Looking across the gallery space allows attendees a show of beauty in polished floors and artfully salvaged brick walls and showcases. 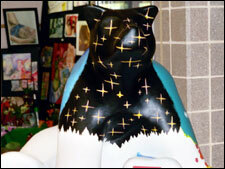 BASH's 2006 Arts Expo allows Chris D'Antonio's award-winning Bear Fever bear an opportunity to show off as finished project. Chris demonstrated his techniques at the 2005 Arts Expo, painting his unfinished Monty during the show. Student work displays a variety of talent and media. Art lives in the identity mark and typeface of the college. 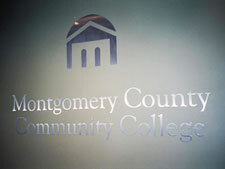 Montgomery County Community College has two conveniently located campuses in Blue Bell and Pottstown, with additional learning locations in Willow Grove and Lansdale. In 2004, the College served more than 16,000 credit students and close to 12,000 non-credit students. With a 17:1 student-faculty ratio, the College boasts a nationally recognized, award-winning faculty committed to working closely together with students in the learning process. 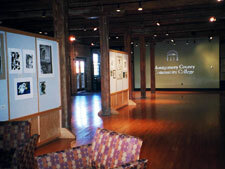 The College’s comprehensive curriculum includes 908 associate degree/certificate programs in 52 areas of study, specialized workforce development and continuing education programs, and over 100 distance learning courses that leverage the College’s nationally ranked use of innovative technology. 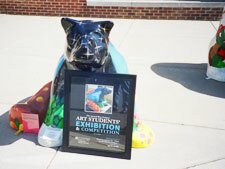 For Bear Fever Montgomery County Community College encouraged students to submit designs for the opportunity to create the college’s Bear Fever bear. Chris D’Antonio received the honor; his essay about himself follows. Art is a passion of mine, but it was not always. At the beginning of grade school I started out by just doodling on scrap paper with my friend Gordon. We tried to draw the coolest pictures and then compare them to see whose was better. 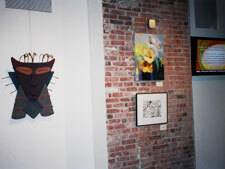 Now, fifteen years later, we are both art majors; Gordon is studying at Shippensburg, and I am at Tyler School of Art. I was not accepted into Tyler immediately after graduating from Upper Merion High School because of weak grades. I attended MontCo for two semesters and earned enough core credits to compensate for my poor academics. Just as important, I had to build a strong portfolio. In the fall I took drawing with Patrick Winston. I worked mostly with charcoal on a variety of assignments such as the human figure, landscapes, perspective and much more. 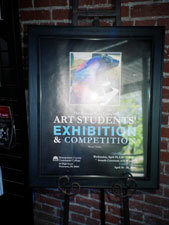 I was pleased with my work; in fact, one of my drawings earned an Honorable Mention at the student art show. Later that year, I studied two-dimensional design with J. Cardillo and learned basic properties of design such as composition, value, color relationships and more through interesting assignments. One of my favorite assignments was composing a design of two different ideas into one piece: the Big Bang theory and the mood of a song. This particular design won second prize at the student art show. Also, during the span of the school year I was thinking up an idea for the STARS student art contest which had a theme: “An End to Hate.” I had many ideas, but, fortunately, my final decision won first prize. In “Reflection of Society,” I used mixed media (oil paint, charcoal, newsprint, mirrors and glaze) to comment on society and it suggests optimism as a solution to end hate. 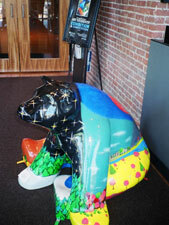 Finally, I ended the year with designing and painting the Boyertown Bear Fever bear representing MontCo. 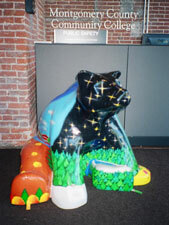 My concept for this community art project was to include a nature scene around the bear symbolizing the black bear’s natural habitat which once existed throughout Boyertown. My experience with MontCo provided a great experience and opportunity for me to be accepted into a prestigious art school; and now that I am at Tyler, I have set new goals as a student and an artist. First, I need to keep my grades up and work hard. I like Tyler because I am constantly exposed to new material. There is a balance among all of this constant information. For example, there is a balance between 2-D and 3-D, real and abstract, large and small scale work assignments.